Everybody knows that when you sit at roulette table you will not be alone there: online roulette games are social games and you are in a contact with other players and casino employees when you come and try winning at roulette. 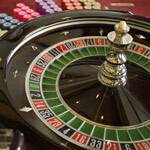 That is why roulette rules are not the only thing you should know and follow when playing the game of roulette. You also need the knowledge of roulette etiquette in order to have a pleasant game and a good mood; moreover, sometimes your winning at roulette depends on following the obligatory options which every casino has for sure. 1. Use the special colored chips when playing roulette; do not use regular casino chips for this game. 2. Respect other players: do not try to disturb them, touch their chips or something. It is not very pleasant to play when somebody screams or speak loudly near you, is not it? 3. Some of casinos have a dress code for the gamblers who come to play roulette games; usually, this rule is for European countries. So, please, check the rules of a casino before going there. 4. Do not try to change your bet or make another one after a croupier says the phrase "No more bets!" 5. Do not do anything with your chips and bets when "a dolly" (a special thing for marking the winning bet) is on the table already. 6. Do not toss your chips; place them carefully on the table in order not to make a wrong bet. 7. Do not use phones or cameras at the roulette table. 8. There should be only money, chips, drinks and cigarettes on the table: no bags, no purses. 9. A croupier is not allowed to take money from your hand. Want to buy chips? Place your money on the table. 10. If you spoil the table layout by your drinks you will be forced to pay. 11. If you do not follow the rules and etiquette you may be asked to leave the table. 12. Do not be afraid of asking a croupier any questions concerning the rules: s/he will be glad to help you. You are also welcome to speak if you see some mistake. 13. Do not forget to change your winning roulette chips for regular casino chips before going to exchange them for real money. They will lose their value if you do no do that. 14. It is a common rule to tip a croupier after the game. This rule is usual for American Roulette though dealers are usually prohibited to take tips from clients. Anyway, if you want to thank a croupier, you can place one additional bets and say the phrase: "This one is for you". Tips are given usually when you are lucky to win or when a croupier gives you some advice concerning the rules or something. Remember that, in spite of the fact casinos always have a lot of money, a croupier has a salary of an average employee, so this can not be applied in online casinos like games.paddypower.com. 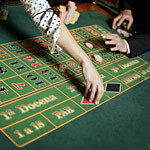 To play online you should search for another tips expesially designed for gambling in the web.